As the shift to insides departments grows while the number of field sales reps shrinks, the C-Level managers are doubling-down on expectations of inside sales productivity. It isn’t enough that the number of prospects and customers spoken to on a daily basis quadruples for inside vs. outside reps. Nor that the average cost per inside rep is only 50-60% of the outside rep total compensation.There is a constant pressure for increased sales productivity in the face of high rejection rates while the count of salespeople per manager continues to grow. The answer everyone suspects is a technology boost that helps the ISR manage their workflow and this is all driven by the relatively new science of queue based lead management. 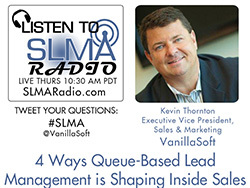 In this unscripted, sans PowerPoint program, Kevin Thornton, EVP of Vanillasoft explains to the SLMA Radio Host Jim Obermayer how queue based lead management makes the difference between success and failure for any company with high lead volumes and inside sales people. A strategic, global sales & marketing executive, Kevin’s career spans over 20 years leading sales teams that have generated over $1B in software sales. Kevin has forged dozens of strategic partnerships and has executed the go-to-market strategy for hundreds of leading software solutions through multiple channels and regions.As Executive Vice President, Sales & Marketing for VanillaSoft, Kevin is responsible for accelerating global customer and revenue growth and overseeing all new customer engagement and acquisition strategies. Kevin’s key areas of focus are SEO & Social Media Marketing, Business Development, Channel & Alliance Partnerships and Demand Generation. Prior to joining VanillaSoft, Kevin served as Senior Vice President Sales & Marketing, Americas at Corel Corporation where he was responsible for all regional sales, marketing, alliances, and business development activities. Prior to Corel, Kevin served as Senior Vice President Sales for Sage Software’s Small Business Division. Kevin resides in Dallas, Texas and is an honors graduate of the University of Ottawa in Ontario, Canada. VanillaSoft is the industry's leading software for sales-by-phone professionals. VanillaSoft’s intuitive and easy-to-use inside sales software takes the best of CRM, Lead Management, Telemarketing and Appointment Setting applications to create the most productive phone sales environment available today. The VanillaSoft platform allows customers to see increased productivity, higher contact rates, and sales accountability in ways no other sales-by-phone solution does. VanillaSoft’s queue-based lead management takes sales to a whole new level: it’s Sales to the Power of the Queue. Through queue-based lead management, inside sales organizations see increased productivity, gain performance visibility, and realize a greater ROI on leads.